One day two years ago, Consuelo Barrego’s nose wouldn’t stop bleeding. So she went where she had never been before: to San Francisco General Hospital. She left the hospital with a $3,600 bill and no explanation. 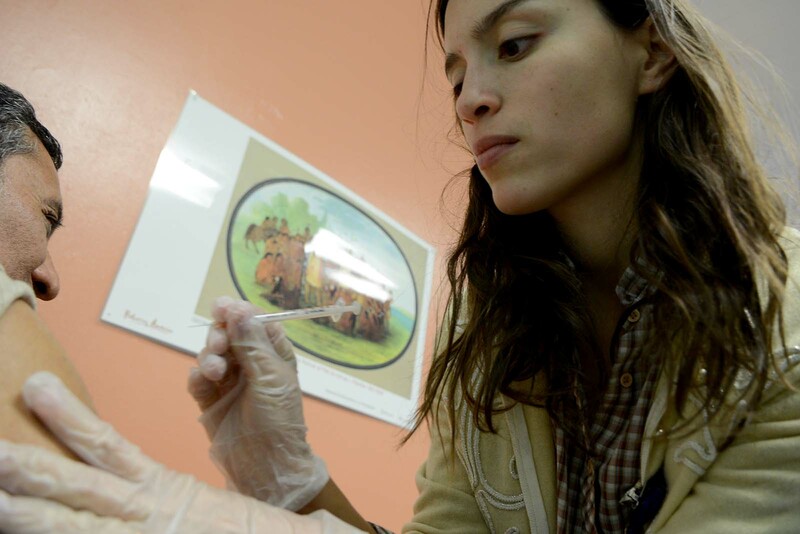 With that experience in mind, Barrego — one of 46,000 employed San Franciscans who lack health insurance — turned to La Clinica Martin-Baro, an all-volunteer, free pop-up clinic. Once a week on Saturdays at the Mission Girls building on 24th Street, La Clinica provides ongoing care for people in the Mission’s immigrant communities, relying entirely on donated supplies. Through a partnership with medics from the University of California at San Francisco and students from San Francisco State University, the clinic helps close the gaps in the medical system. Barrego’s two-year-old son, for example, has a pediatrician. But even though doctors agree that the health of the mother is just as important as and an integral part of a child’s health, Barrego’s job as a housekeeper doesn’t provide health insurance. Obamacare will not close the gap for those who are undocumented, said Felix Kury, the clinic’s director and one of its founders. Through its guiding philosophy of care with cultural competency, the clinic is an oasis for immigrants. Most volunteers and patients speak Spanish, which makes patients feel comfortable, said Yvette Rico, an SF State student and longtime volunteer. When a reporter began speaking English, she suggested that the conversation be in Spanish, as other people were in the room. Being able to speak the language and understand the culture helps with treatment, said Nicole Betenia. Doctors have to keep in mind that many of the patients have gone through a traumatic journey to get to the United States and are here without their family — their health support system. Post-traumatic stress can affect mental health, Kury said. While La Clinica sees mostly cases of diabetes, high blood pressure and asthma, they also see depression, alcoholism and issues related to homelessness. Cristina, for example, endured injuries and witnessed sexual abuse during her journey here. She couldn’t speak to her family about her experiences. “It affected my whole life,” she said. Other factors, like poverty, can also affect immigrants once they are in the United States. As for Barrego, she is still trying to pay off her hospital bill. She was at the clinic recently, but only to accompany her brother-in-law, who was there to get a physical. Does the clinic accept donations? If so, how does one go about giving? On behalf of Clinica Martin Baro member I would like to thank Mission Local news for publishing the article about our clinic. I also want to take the opportunity to invite everyone to our fund raising event “Salsa Night” taking place this November 30th. The venue is at the Women’s Building San Francisco. The clinic is run by all the generous contributions from people of our community. Hence, if you are unable to join us in the event, please feel free to make your donations addressed to : CHE Clinica Martin Baro and mail it to the address below. Where exactly is this clinic located? I would love to be a volunteer there if possible! Mission Girls building on 24th Street. It says that in the article.